Located on Baranof and Chichagof Islands, Sitka is an Alaska Inside Passage cruise port of call and a fun destination on its own. Visitors will find a real variety of things to see and do, most of it within, or in walking distance, of the waterfront downtown. Tlingit totem poles, Russian-era structures, and Sitka forest and wildlife are all highlighted at this fascinating historic preserve located just east of downtown. Begin your visit at the 113-acre park's visitor center, where you can learn about local history and people through artifacts, exhibits, and films. The Southeast Alaska Indian Cultural Center, located at the visitor center, where you can learn all about Northwest Coast native art through demonstrations or hands-on classes. Fans of Northwest Coast art will enjoy the National Historical Park's many fine totem poles, located both inside the visitor center and around the grounds. You can view the outdoor poles on a self-guided walking tour that will also include the Russian Bishop's House, an 1804 battle site, and the Russian Memorial. The site is situated on the scenic shores of Sitka Sound at the mouth of Indian River. Shorebirds, raptors, Sitka blacktail deer, river otters, and spawning salmon are among the wildlife you might see during your Sitka National Historical Park visit. First established in 1895, this museum houses the collection of Sheldon Jackson, a 19th-century teacher and missionary to traveled all over Alaska. Located in an octagonal brick building, the Sheldon Jackson collection includes art and artifacts from Alaska's Native people, including Aleut, Athabascan, Eskimo, and Northwest Coast tribes. Traditional masks, clothing, watercraft, and stone carvings are among the museum's fascinating artifacts that are on display. Representing the full range of Native Alaskan life in the nineteenth century, the exhibits provide an interesting glimpse into life in the cold North. This still-operating Russian Orthodox cathedral, rebuilt after a 1966 fire, is a living example of Sitka's Russian heritage. Those who have the opportunity to tour the cathedral's interior will see gorgeous Russian icons and other religious artifacts that were a part of the original structure built during the era when Sitka was under Russian control. Known just as "Castle Hill," this downtown Sitka park preserves the site where Russia formally handed Alaska to the United States on October 18, 1867. Previous to that, the hill served both the Tlingits and the Russians as a fortified lookout. 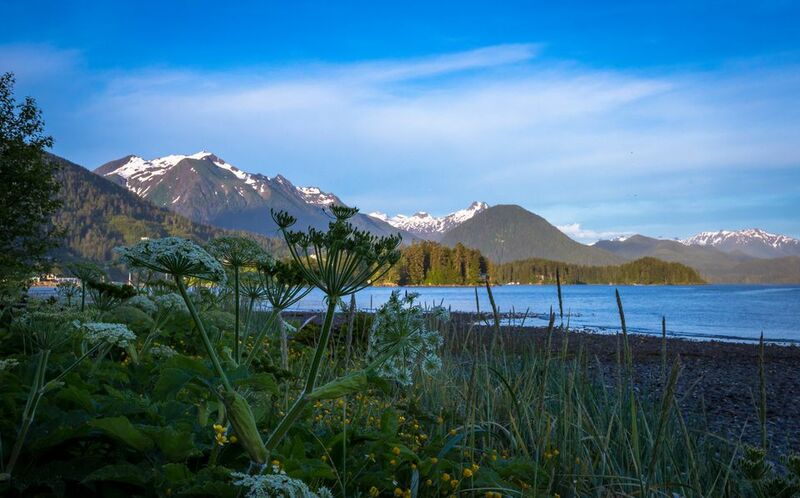 Visitors to this official state historic site will enjoy the walk up the wooded hill, where you can enjoy a lovely view of downtown Sitka and the surrounding waters and mountains as well as interpretive panels. Just east of the Sitka National Historical Park, the Alaska Raptor Center serves as a rehabilitation facility for native owls, hawks, falcons, raven, and eagles. Visitors will have the chance to observe the enclosed flight training area through a one-way window. While the goal is to return as many raptors as possible to the wild, some cannot be fully rehabilitated and remain residents of the Alaska Raptor Center. Some of these are on display to visitors, providing the rare opportunity for up-close views of these magnificent creatures. There are two different dance organizations that provide regular performances for Sitka visitors, each providing a unique glimpse into local culture. Scheduled performances are primarily timed to accommodate cruise ship visitors. New Archangel Dancers - Also providing short performances for Alaska visitors, the New Archangel Dancers The New Archangel Dancers represent Alaska's Russian history and culture through ethnic folk dance and song. The perform at Harrigan Centennial Hall right in downtown Sitka. Sheet'ka Kwaan Naa Kahidi Native Dancers - These Tlingit dancers share traditional songs and dances in 30-minute performances at the Tlingit Clan House. Sitka Historical Museum is your place to learn not only about the island's Native and Russian history but about other eras and influences as well. Sitka's maritime and forestry industries and the US military presence during the 19th century and World War II are addressed through exhibits and artifacts. Sitka Whalefest (November) - Many marine mammals, including orcas and humpback whales, visit the waters around Sitka throughout the year. Whalefest celebrates these creatures with a series of cruises, lectures, and other community events. Visitors who wander around charming downtown Sitka will find a variety of fun shops and galleries offering wonderful Alaska souvenir and gift items. Here are a few that stand out.